Godzilla. That's what weather forecasters are calling the powerful El Niño weather pattern that has been building in the Pacific Ocean since summer. Its impact on your swimming pool depends not only on where you live, but also how well you prepare your pool and patio area for an onslaught of wind and rain. According to the National Oceanic and Atmospheric Administration (NOAA), El Niño means more rain than usual in many areas of the country. However, even without monster-type deluges, wintertime typically brings unfriendly weather to most areas of the country. You don’t have to live in an El Nino zone to appreciate that it’s always good to have your pool and backyard ready for an episode of heavy wind and rain; doing so helps minimize any damage in the first place and the amount of needed cleanup and maintenance later. So, how do you keep Godzilla—and any nasty storm—from wreaking havoc on your backyard resort? Consider some steps that can reduce the risks and help protect your pool and outdoor living area. Lots of rain can cause water to collect and flood areas of your backyard and wash dirty water into your pool. A good backyard drainage system will keep that from happening. Depending on your deck configuration and material, deck drains may be part of this system. Test them before a deluge hits. You can use a garden hose to check how well the water drains and that the water flows away from your house and from your pool. If the water drains slowly, it may be a sign that the opening has become clogged with a slow build-up of debris. (If you have strip-type drains—known as decco drains—be sure that that nothing is blocking the ends where the water exits.) Yard features and materials like grass, mulch, or decorative pebbles can be culprits that keep water from efficiently running off the deck and into the yard. Clear out any obstructions. If any portion of your yard negatively drains toward your pool and deck, consider contacting a landscaping / drainage professional to make recommendations that will help prevent flooding issues and other problems that can result from poor drainage. Watch out for your roof as well; if it is pitched toward your backyard and is dumping water onto the yard and into the pool, adding roof gutters may solve all or part of the problem. 2. Secure loose items around the patio area. Major windstorms can pick up common backyard items and turn them into flying bombs that can crash right through your French doors and windows. Don’t let that happen. Make sure that any toys, patio accessories that are not built-in—like potted plants or portable BBQ grills—and loose pool equipment like that pool cleaning net, and any other miscellaneous items get stored inside a shed or inside your home. Any lightweight patio furniture should go too. In particular, patio umbrellas need special attention. At the bare minimum, close and secure them with a tie, but it is much better to properly store them inside. Powerful winds can pick up open umbrellas—along with any furniture to which they are attached—and drag them around your yard. If particularly strong winds are expected, and you have a removable safety fence, take it down and store it. 3. Clean up your landscaping. Loose leaves, twigs, pine cones, pine needles, seeds pods, tree blossoms, and the like can blow into your pool or onto the winter pool cover. This is a good time to clean them up so they are gone before the wind kicks them up. Bush and shrub trimmings should be on your hit list too. Sweeping winds could break off small or dry parts of them, scattering them around your pool and yard. Whether oaks, pines, palms, citrus, or most any other variety, trees can pose particular problems during a storm. Take a good look at your backyard trees, and consider trimming limbs that could fall and scratch up or more seriously damage your pool cover, diving board, and other features or accessories. 4. Give extra attention to your pool water. While your pool water may overflow from ongoing rain, that does not mean you should empty your pool as a precaution. At most, you can drain it down a few inches. Never empty a pool; without enough water inside to support the structure’s sides and bottoms, the pool could pop out of the ground. You also want to consider the chemistry of your pool water. Heavy showers are bound to dump plenty of debris, spores, and other contaminants into it. This disturbs water balance—creating problems such as algae and bacteria growth and imbalanced water that irritates swimmers’ skin and eyes. 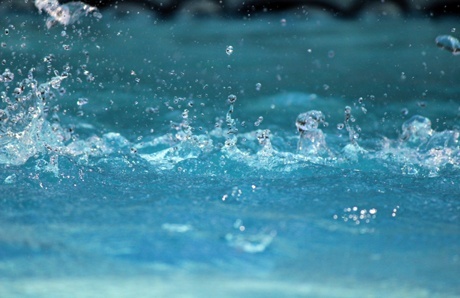 Therefore, if a downpour is on the way, it's a good idea to increase disinfecting power to destroy anything growing in the pool and help curtail future growth. To do so, shock your pool water with a large dose of chlorine. Or, if you have alternative sanitizing equipment like an ozonator or a salt generator, run the system extra time in advance; doing so will help compensate for the additional organics that will enter your pool from the storm. 5. Take preventative measures with your pool equipment. If you have an automatic cleaner in the pool, detach and store it. This step will prevent damage or blockage to the cleaner or to the cleaner line from excess debris in your pool as a result of a storm. Before a thunderstorm hits, another good step is to turn off any pool equipment, and shut off the circuit breaker to the pool systems. Depending on your heater, shut off the gas or propane supply. Putting in some effort now—in advance of wet weather—can pay off. When the weather clears, you will be glad you did for easier clean up and so you can use your pool, spa and backyard as soon as you want.